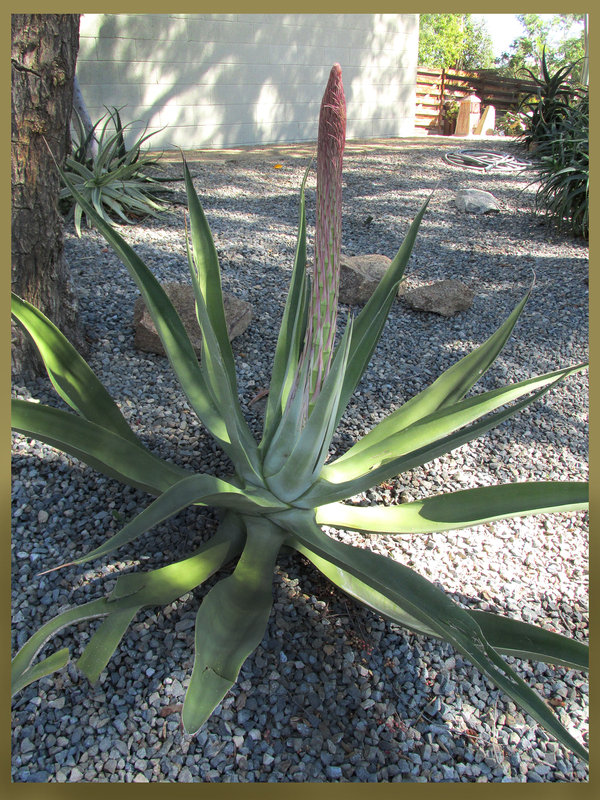 You may remember the post before last (click here) that featured my large agave and its brand new flower stalk? Well, that’s it in the photo above; as you can see it’s lots taller two weeks later and it’s got new bud-tipped branches. I don’t think it’s yet at its full height … but it’s not alone. My octopus agave has suddenly equipped itself with a blush-inducing pink flower stalk on the 14th Street side of the Rancho. 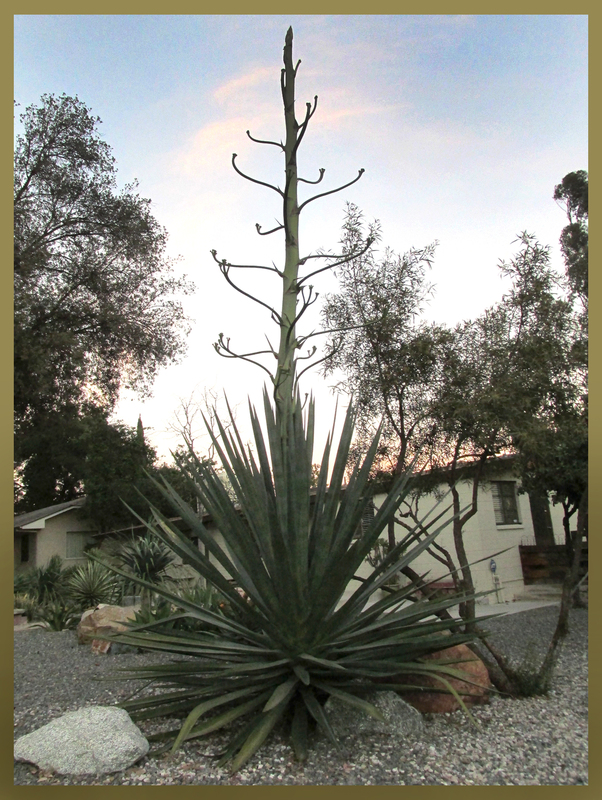 Always a stand out — what with those undulating arms — this agave now really seems to be of the sea floor. I can’t wait for the bloom to open! Not to be left out, the Rancho’s Redwood Avenue rear area also features a huge stalked agave. Although this specimen isn’t nearly as photogenic, it’s equally as large in every respect as my favorite at the top of the story. Everyone who sees them asks the same question: Will these plants die once they’ve bloomed? I always give the same answer: Probably they will, although I hope not. At least not before the (humming)birds and bees have had their fill … That whole “love something, let it go” thing is never easy. 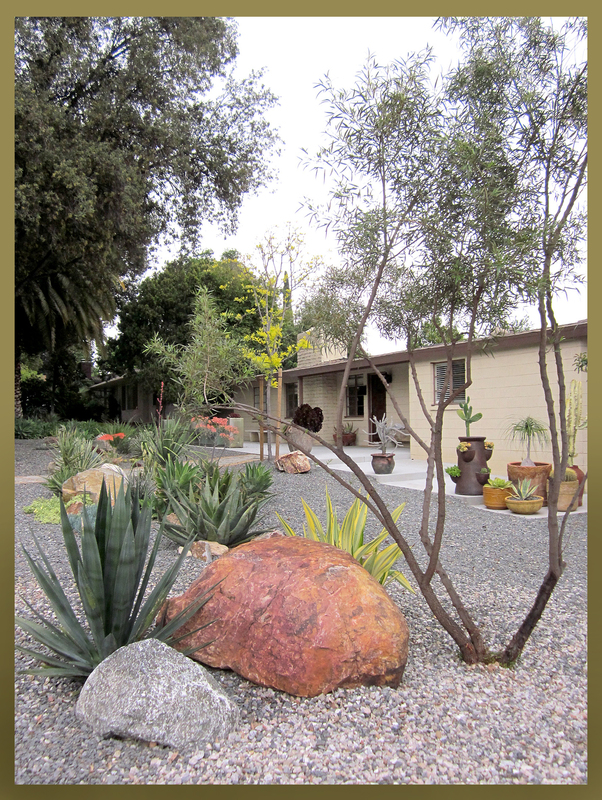 I happened to be on Pinterest the other day and I saw that someone had pinned this photo of the Rancho’s front yard in 2011 … It took me a minute before I realized that in the foreground, next to the big red rock, was the agave that has stalked so spectacularly on the corner. Look back at the first photo in this post and you can see that it now completely overshadows big red, and is taller than the African sumac tree next to it. That I’ve been documenting the Rancho’s garden — almost inadvertently —is truly one of the best things about having this blog. As always so inspiring……You are motivating me to keep simplifying (I know that is hard to believe of me, ha)….so happy to once again see your beautiful front garden….Happy V-Day to you and Paul..
We wish you and Danny the same! It’s so lovely to see the growth and blooms that spring gives us. I’m going to have to do a drive by to see these in person. If that’s ok? Can’t wait. As ya know I don’t have much that large. Thanks! Will get back with ya on the when. Happy Valentine’s Day! Your garden (then and now) is inspiring as ever. Also, thank you for writing (four or five years ago? Time flies) about the Jurupa Mountains Discovery Center Aloe Walks — I went on last week’s walk with Buck Hemenway, and went back today not so much for the V-Day walk as for the plant sale afterwards. 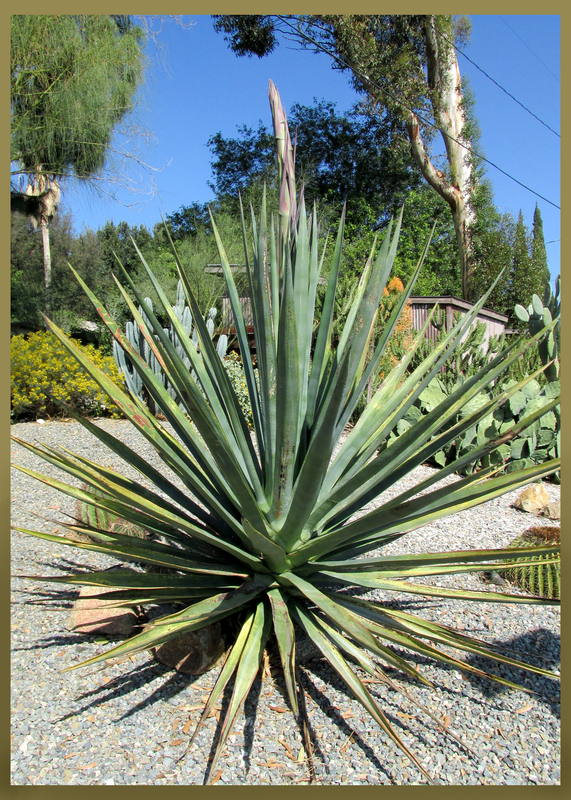 Ay, ay, ay, did I ever find some nice aloes and agaves, at great prices! The Center has a new director, and improvements are in store, sounds like. Thanks again, and have a wonderful Valentine’s weekend! Oh, very cool Luisa! We didn’t make the Aloe Walk or sale but it’s good to know that the center is alive and kicking … and improving. happy V-Day! OK ….since my name is Valentine, I have to wish you a Happy Valentine’s Day also. And no, my birthday is not Feb. 14. Your Agaves are so beautiful. I wish I had room for at least one, but my jardin is too small. Most of my plants are helliconias, but they are also pretty. I’m anxious to see the octopus agave in bloom. I’ve never met anyone named Valentine before; very pretty. Speaking of pretty, helliconias are gorgeous … lucky you! Now you have….I was named after my aunt. I’m not that fond of it which is why I just use Val. We are having a lot of snow (not a fraction of what N.E. is getting) , and the morning lows are hovering around 0 degrees F, so I’m GREEN with envy over your warm climate. Whoa! I cannot even imagine those temperatures … You have my sympathies, JR, bundle up. Here’s wishing you an early spring! Thanks! The local newscasts are giving us a countdown to the first day of spring. Today’s HIGH is going to be only 6 degrees. Catch a flight to the Midwest today and you can find out! Um, not gonna happen! Paul’s brother is in Chicago and has been sending photos that caused my teeth to chatter, so I’m happy to take your word for it! I remember that grouping of pots in the Pinterest photo — maybe they’re still there, hard to tell in the first photo now, behind that giant blooming agave. So much fun watching the Rancho evolve. Hey, Denise, that grouping of pots went at my first big sale … happily I can visit them in their new home; the benefit of selling to friends and their siblings.